Quite often, I get emails from readers who lament all of the mistakes they’ve made along the way, as though they’re symbols that they’ve somehow failed at money. I don’t look at it that way. I look at failure at personal finance – at anything – as the bedrock of success. I was leafing through a copy of Dara Duguay’s excellent personal finance book for college students, Please Send Money, when I stumbled upon the opening sentence of the preface, which I felt was worth repeating here. I learned about money the hard way. I know that feeling. I learned about money the hard way, too, at least from my perspective. At the very least, I had no clue how to manage my money after college and I eventually wound up staring off a scary precipice of debt. It’s a story shared by a lot of people out there. A cursory look at the plethora of personal finance books out there shows this to be true. Many of them were written by people who have recovered from dangerous personal finance situations – they learned the hard way. Most of the people buying and reading the books are in a similar situation – they learned the hard way. There’s a decent chance that, if you’re reading this, you’re learning (or have learned) the hard way, by facing a very bad personal finance situation. The experience is much like a toddler being given a spoon and a bowl full of baby food and being told to eat. At first, there’s a bit of innocent and delicate playing with the spoon – dipping it into the food and stirring things around, and maybe actually getting that first bite in the mouth. It’s just like a person with no financial education with a credit card – they make a few reasonable purchases at first and keep the balance paid down. We’ve made a complete mess of everything, a mess that’s going to take a long while to clean up. Even worse, we often keep falling into the same mistakes again, making more messes. But just like a toddler with a spoon, we learn from our mistakes. We start knowing how to conserve the resources we have and not making a big mess with them. We might spill a little along the way, but eventually we learn how to do things cleanly and efficiently. 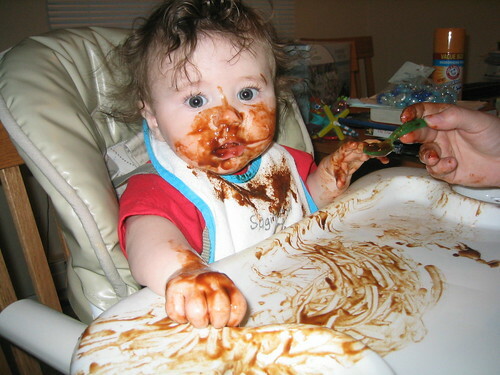 We all make big, messy mistakes in life, just like the poor child above covered in prunes. The difference between success and failure is what we do with those mistakes. Do we lament them, focus in on them, and allow them to determine our fate? Or do we sit back, figure out what went wrong, use the pain of our mistakes as fuel, and take another crack at it? So many of us are learning from our money mistakes as I write this. It is the pain of those mistakes – and the understanding of the many rewards ahead of us if we keep at it and learn the techniques – that keeps us moving forward and learning how to succeed. When you look back on your mistakes, they’ll taste bitter – but hopefully a little bit sweet as well. It is from those mistakes that you grow. Don’t let them get you down. Instead, realize that mistakes are just the building blocks of later success.